Plastic Greenhouse - Who Has The Best? A plastic greenhouse can be an ideal and cost effective solution for keen gardeners who want to protect their seedlings or grow their plants all year round. They typically cost less to buy than timber greenhouses, and the glazing is usually tougher as well, which makes them an ideal choice for people who are likely to have children playing around their greenhouse. Advances in design and technology in recent years also mean that polycarbonate greenhouses are catching up with their glass competitors when to comes to insulation and light transmission. To help you find the best model to meet your needs, WhatShed have created this guide to help you find your ideal plastic greenhouse. There are an increasing number of plastic greenhouses on the market, and so choosing our top 20 was never going to be an easy task. We’ve taken into account the price, and overall value, as well as the capacity, design and durability of the building. 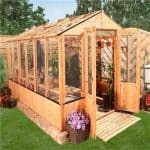 In this way we’ve created a list that has greenhouses to suit all budgets and to suit all sizes of garden. Selecting the number one plastic greenhouse currently available for sale online in the UK was a difficult task, thanks to the high quality of all twenty models featured in this league table. It’s well done then to the Palram Harmony six foot by fourteen foot greenhouse with base which claimed the top spot by offering excellent value for money along with high build quality. Whether you’re looking for a plastic greenhouse or a timber shed, WhatShed’s in depth and independent reviews can help you find exactly what you’re looking for. We’ve reviewed lots of Palram greenhouses, and what we always like to see from their models is that they’re well constructed, come with the reassurance of an extended warranty period, and offer exceptional value for money when compared to similar sized greenhouses from other manufacturers. 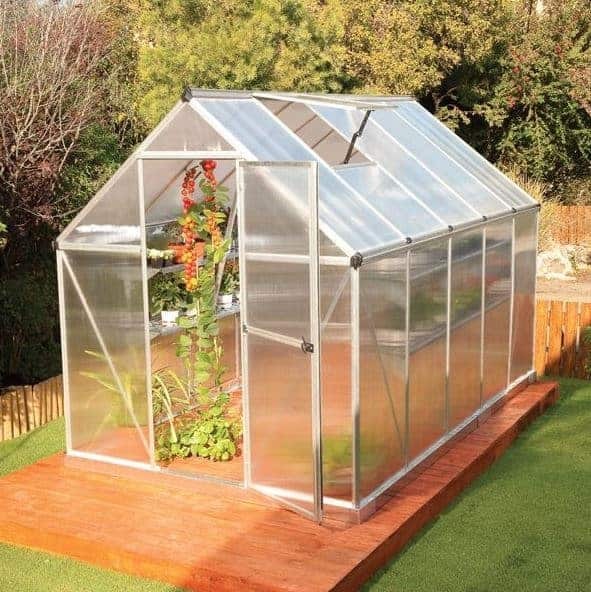 Those are certainly qualities that we found in this six foot by fourteen foot Harmony model, and indeed the price offers such great value for money that we have no hesitation in naming this our number one plastic greenhouse currently available for sale online in the UK. The sheer scale of it, with a base area of 1.85 x 4.24m, means that it can be used for professional as well as keen amateur gardeners and yet it still comes with a price tag of less than five hundred pounds. 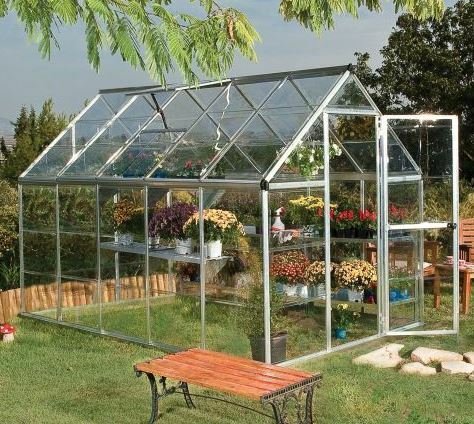 The silver aluminium frame feels strong and sturdy, and comes with the extra peace of mind of a five year warranty against rust, which we feel is a reasonable addition for a plastic greenhouse of this size and prize. There are two opening windows in the roof, so even with a relatively long greenhouse it still feels airy once inside. 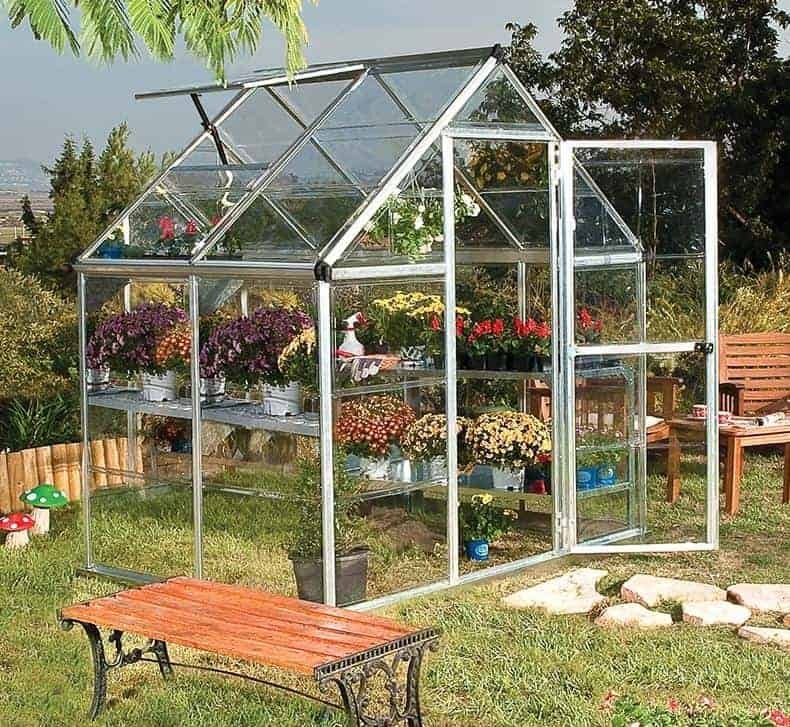 With a base included as standard as well, we feel that this would make an excellent buy for somebody looking to upgrade to a larger plastic greenhouse, or those who want to turn their gardening hobby into a job. This plastic greenhouse from Nison may not be one of the largest models in our top 20 league table, but that in itself makes it a smart choice for a garden where space is at a premium. 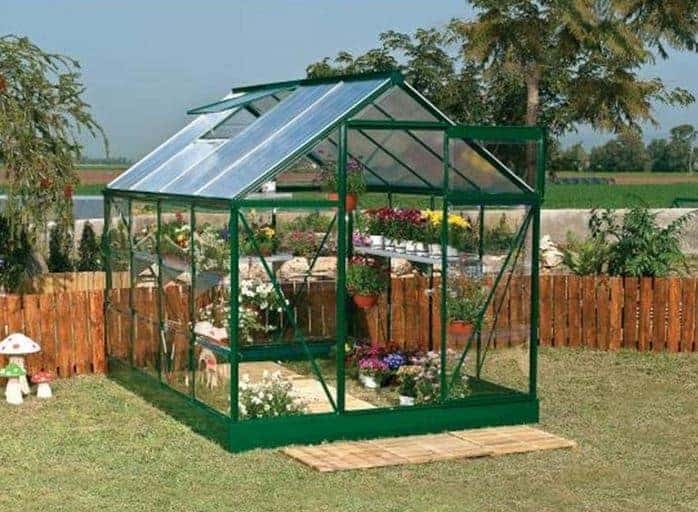 It also offers excellent value for money, and it has been designed with ease of assembly and ease of use in mind, and these factors, along with its excellent toughness and durability, deservedly earn this the runner position in our list of the best polycarbonate greenhouses. We know that many people find the idea of erecting a greenhouse or garden building a daunting proposition, but Nison make it much easier than you might expect. The plastic glazed panels simply click into place along the aluminium frame, and all the tools needed for this task are included in the standard package. In effect, this means that this takes around half the time to install that a standard plastic greenhouse of a similar size would take. What we also really appreciated was the 15 year frame warranty, which shows just tough and reliable the aluminium fabrication is. 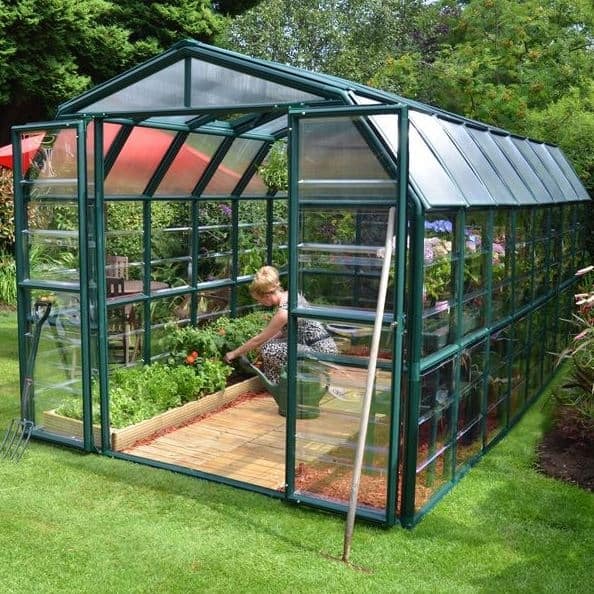 This is as long as the warranty on any other greenhouse featured in our league table and adds even more value to what we feel is already a very affordable greenhouse. One thing that unites the top three in our WhatShed plastic greenhouses guide is that they all represent exceptional value for money. This is one of the reasons that many people select a polycarbonate glazed greenhouses over a traditional glass glazed version, but perhaps the best value of them all comes from this mid sized Palram Mythos model. With a base width of 1.80m and base depth of 3.10m, you get a lot more growing space than you might expect for a plastic greenhouse that comes with asking price of not much more than three hundred pounds. We were pleased to see that a free base plinth is included as well, adding even more value for consumers. A 5 year warranty is included and covers both rust and discolouration. This isn’t something we always see provided with a plastic greenhouse which is as inexpensive as this, although a longer warranty could have seen this climb even higher up our rankings. An integrated guttering system is included as standard, allowing the owner to collect rainwater and recycle it for use in watering the plants. It’s a feature that we really liked to see, especially when more and more people are concerned with ways to reduce their carbon footprint. If you’re looking for a large scale plastic greenhouse that will provide an all weather solution for your plants and seedlings then this Palram model could be an ideal choice. It’s the most expensive greenhouse in our top 20 league table, and this accounts for it not being inside the top three as it could otherwise have expected to be. 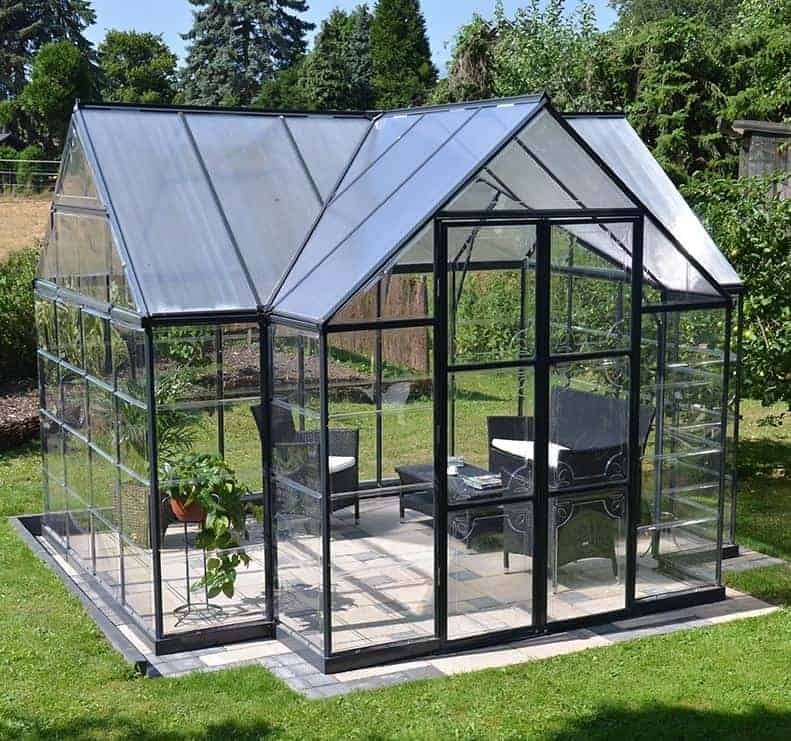 If you don’t mind spending two thousand pounds for a high quality and very spacious greenhouse, however, this should be your first consideration. It should also be noted, of course, that this still represents good value for money when compared to timber greenhouses of a similar size. We found this to be a really eye catching plastic greenhouse, thanks to the dark grey colour scheme added to the frame rather than the silver or green that we’re more used to seeing. We were also pleased to find that extra thick aluminium had been used for the frame, which gives it the strength and stability that a large garden structure such as this needs, and it comes with a reassuring 10 year guarantee. The polycarbonate glazing too was much thicker than we usually see, at 10mm, making it very tough and durable and virtually shatter proof, and this also adds to the security provided by the lockable hinged door. 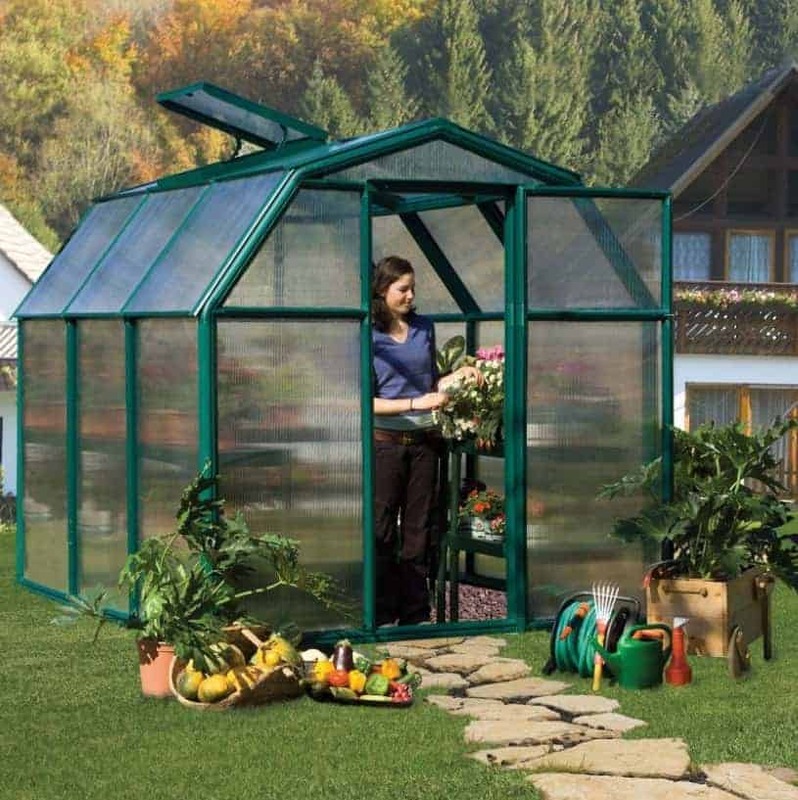 There are four important dimensions to consider when looking at a plastic greenhouse. The base width and depth of 1.95 and 2.50m make this very much a small to mid sized model, although there’s still plenty of room to store plants. Equally important, however, are the ridge and eaves heights, and as this has been designed to be an extra tall model there’s lots of room to move around in. That makes this not only a great environment to grow plants in, it could also be used as a place to sit down and relax in after a day’s gardening. An opening window in the roof can be used to create ventilation, and there’s also integrated guttering. The aluminium frame has a dark colour scheme that we feel is very pleasing on the eye, and it comes with a 3 year manufacturer’s warranty. What really makes this plastic greenhouse stand out from its competitors, however, and what earns it a place in the top five of our league table, is the price tag attached to it. For a cost of less than two hundred and fifty pounds, it’s now possible to have a good looking and easy to assemble greenhouse, which we feel represents excellent value for money. Palram models feature regularly in our WhatShed guide to the twenty best plastic glazed models that can be bought in the UK today, and their experience and expertise in this area really pays dividends as this six foot by eight foot plastic greenhouse shows. 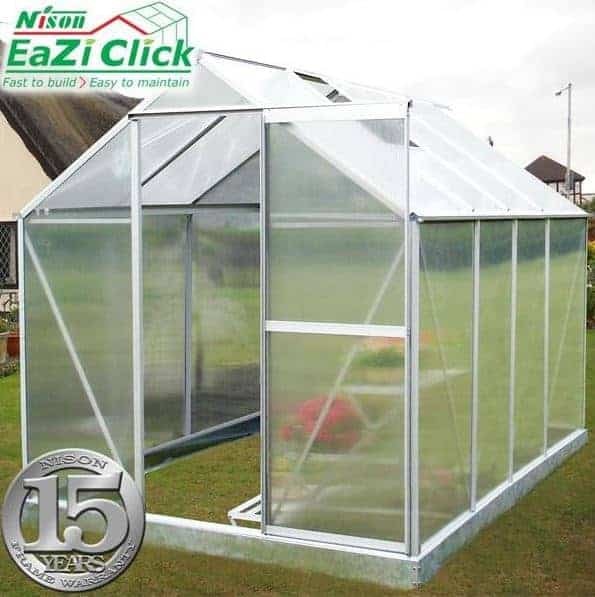 It has an aluminium silver frame which may not look as elegant as some of the green frames that we often see used in the greenhouses we review, but it also helps to ensure that it comes with a very reasonable asking price of less than three hundred pounds. When the quality of components used is taken into consideration, this is enough to earn its elevated place in our table. There’s one vent included in the roof, but with a relatively compact plastic greenhouse such as this that’s more than enough to provide sufficient ventilation on a hot day. The single hinged door is taller than many that we’ve found, and it stays closed thanks to a magnetic latch, which isn’t something that we often see and it ensures that the door doesn’t bang to or open unintentionally in windy conditions. We were also impressed by the 5 year manufacturer’s warranty, providing both peace of mind and additional value for money. This plastic greenhouse has the traditional good looks associated with glass glazed apex roofed greenhouses down the years, and yet thanks to the tough polycarbonate panels in conjunction with an aluminium frame it costs much less than you might otherwise expect to pay. With high polycarbonate panels used as well you won’t have to worry about them taking on a yellow hue over time, thanks to their inbuilt UV protection. With a 5 year warranty provided as standard as well, you can simply put this greenhouse up and then forget about it, and we know that this ease of use and lack of any need for maintenance will prove a huge hit with many owners. Despite the UV safe nature of the polycarbonate, and its very tough double walled nature, it still allows a light transmission in excess of 90%, which is great news for any plants being kept inside. The single hinged door and opening window found on this plastic greenhouse also allow for easy and natural ventilation, so creating optimal growing conditions is easy whatever the British weather throws at us. 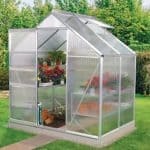 For this price, and the backing of a leading manufacturer when it comes to greenhouses, we feel that this would make an ideal beginner’s greenhouse at a very affordable price. This is a plastic greenhouse that’s green in more ways than one, as it’s been designed to create a more environmentally friendly way to nurture and grow plants. It costs a little more than many of the other six foot by six foot plastic greenhouses that we’ve reviewed, and this has been taken into consideration when determining its position within our top 20 league table. 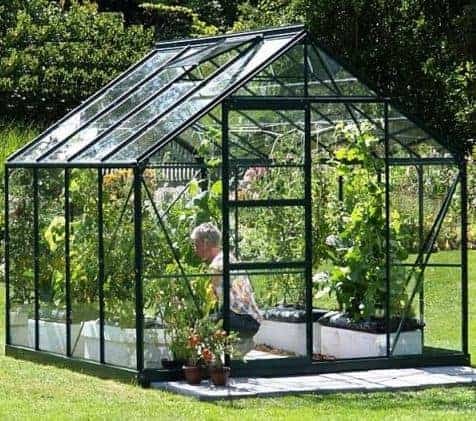 It also has a range of value adding features, however, that we feel make it worthy of consideration by anyone looking for a compact and yet high quality greenhouse. The first thing that struck us about this plastic greenhouse was its appearance. The dark green paintwork is very pleasing on the eye, and ensures that it should fit in well with a typical garden background, and we especially liked the four sided roof that takes a half-hexagon shape. We also liked the fact that the frame is covered by a 7 year guarantee, and along most of the frames that we see on plastic greenhouses it’s made of a tough and durable resin rather than aluminium. Once installed, a process that’s very easy thanks to the ‘push-n-fit’ design, this feels reassuringly strong and so you won’t have to worry if your garden is in an exposed area. Just because a person has a small garden doesn’t mean that they and their plants can’t benefit from the advantages that a plastic greenhouse brings. That’s why we were pleased to see that this compact model, with a base width of 1.85m and a base depth of 1.25m, has all the features and high quality components that we find in the larger models within this range. 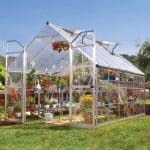 It’s certainly worthy of consideration by anyone looking for a small sized greenhouse, especially one who is also working on a tight budget. The silver coloured aluminium frame is what we’d expect to see on a budget priced plastic greenhouse, even though we may not always find a 5 year manufacturer’s guarantee attached to it as in this case. What we wouldn’t necessarily expect to see, however, is a guttering system included as standard, so there’s no need to let rainwater go to waste. Ventilation is provided by way of an opening window at the rear of the apex roof, and the magnetic lock included with the single hinged door is another neat feature that shows the attention to detail that Palram have once again taken. This is also the second least expensive metal framed greenhouse in our league table, and this too has helped gain it a place in the top ten. 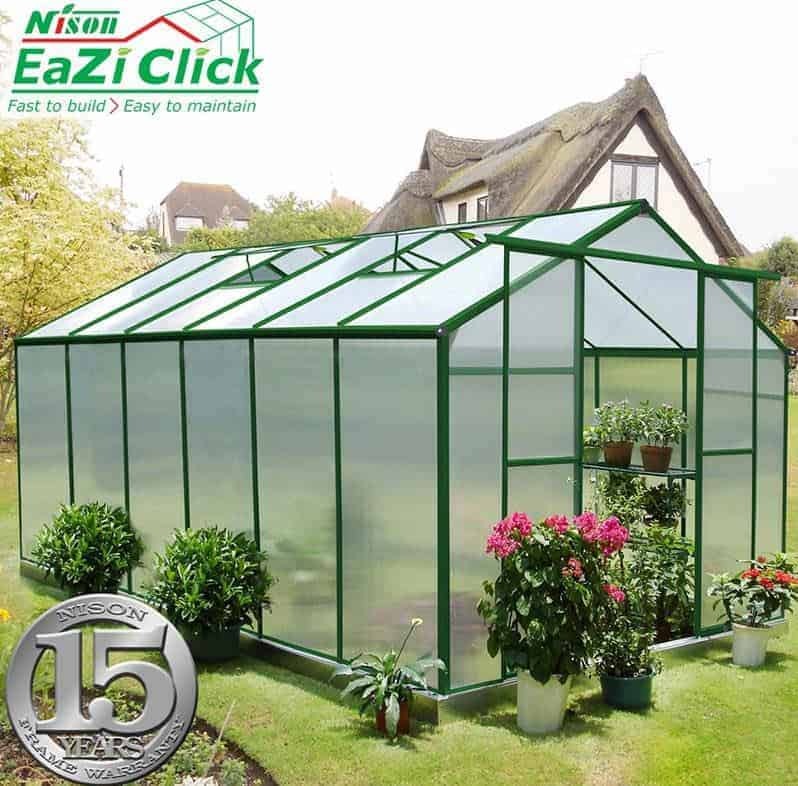 This is the second Nison Eazi-Click plastic greenhouse to feature in our list of the UK’s best, and it’s only the price tag in excess of nine hundred pounds that prevents it from featuring much higher. 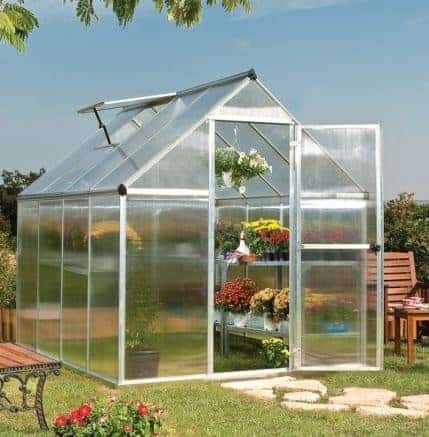 Nevertheless we still feel it represents very good value for money, considering its attractive looks, tough durability, and of course the easy assembly system that will be especially appreciated by those who have assembled large glass greenhouses in the past. 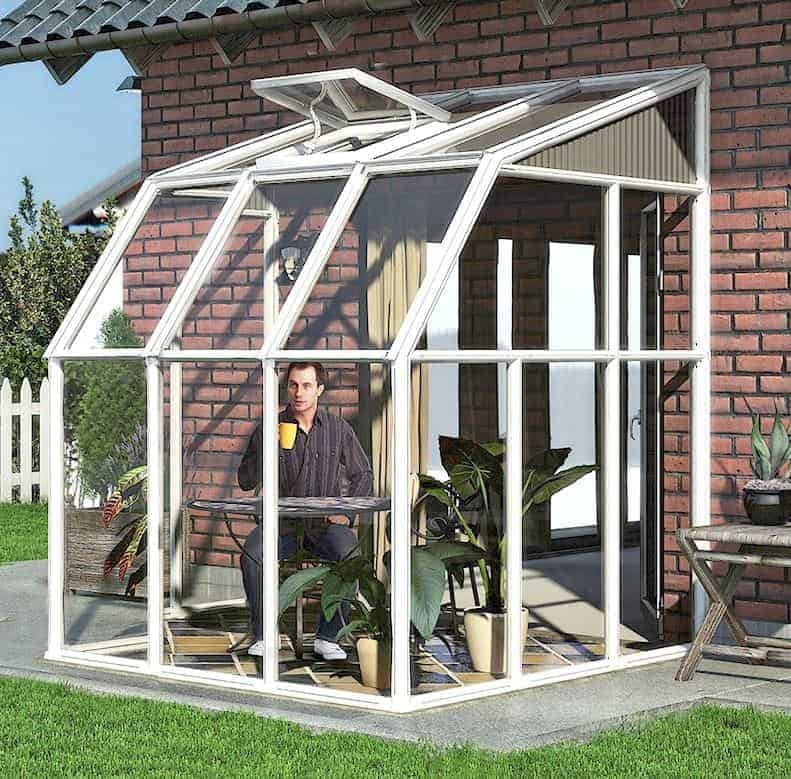 There were two things that caught our eye at first sight when we reviewed this plastic greenhouse, and they serve to create a very attractive garden building that’s sure to draw admiring glances from your neighbours and friends. The first is the dark green colour scheme used on the strong aluminium frame, and the second was the double sliding doors. We don’t often see these used, even on larger polycarbonate greenhouses, although we always welcome them as they make it much easier to carry wide objects such as trays of seedlings through, or heavy and bulky objects such as bags of soil. The 15 year warranty is another thing that we were very pleased to see, so this is one greenhouse that looks good and should stay looking good for many years to come. This is the cheapest plastic greenhouse of any that features in this WhatShed league table, but you certainly wouldn’t know that by looking at it. The glass to ground design, or in this case we should say polycarbonate to ground, is very attractive, and also means that a good amount of light reaches every corner of the interior. As this polycarbonate already has excellent light transmitting qualities this means that even plants kept at ground level can receive the benefits a greenhouse such as this brings, and the inbuilt vent in the roof allows lots of cooling air to enter in on hotter days. We also liked the stylish appearance of the dark aluminium framing, and although this is only covered by a 3 year guarantee that’s still two years more than we often see on the more expensive greenhouses that we’ve reviewed. In fact, this plastic greenhouse looks much costlier than it actually is, belying its asking price of well under two hundred pounds. 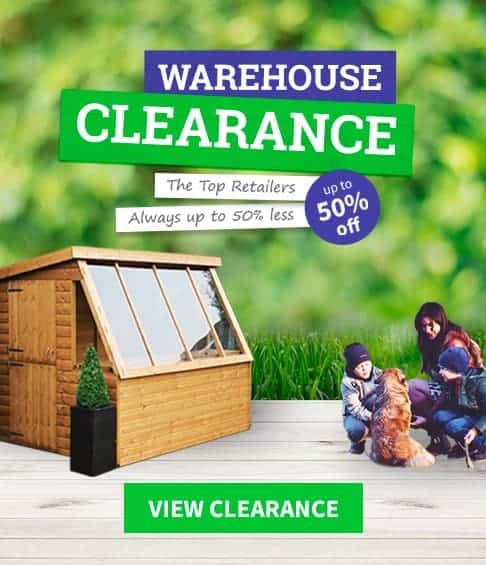 Its compact four by six size, with a ridge height of 2.01m at the peak of the apex roof, accounts for its place outside of our top ten, but if it’s a small greenhouse that you’re specifically looking for then this deserves to be on your shortlist. After one of the smallest plastic greenhouses in our league table, we come to one of the tallest, and yet we’re pleased to say that one of the things that they have in common is that they both use high quality components that are built to last. A mark of this is that the aluminium frame around the polycarbonate glazing is covered by a 10 year guarantee, which shows how much faith the manufacturer has in its strength and resilience. It also comes in a very attractive green colour, so this plastic greenhouse could even become a garden feature in its own right as well as being a very practical plant growing environment thanks to its generous size. There are double sliding doors at the front, which we always find come in very useful especially if pushing a wheelbarrow. Once inside it feels very spacious and welcoming, and that’s thanks not only to the 2.57 x 4.45m base dimensions, but also the eaves height of 1.51m. This is taller than we often see, even on a plastic greenhouse as large as this one, and means that you won’t have to stoop down too much when tending to your plants or when walking around the interior. 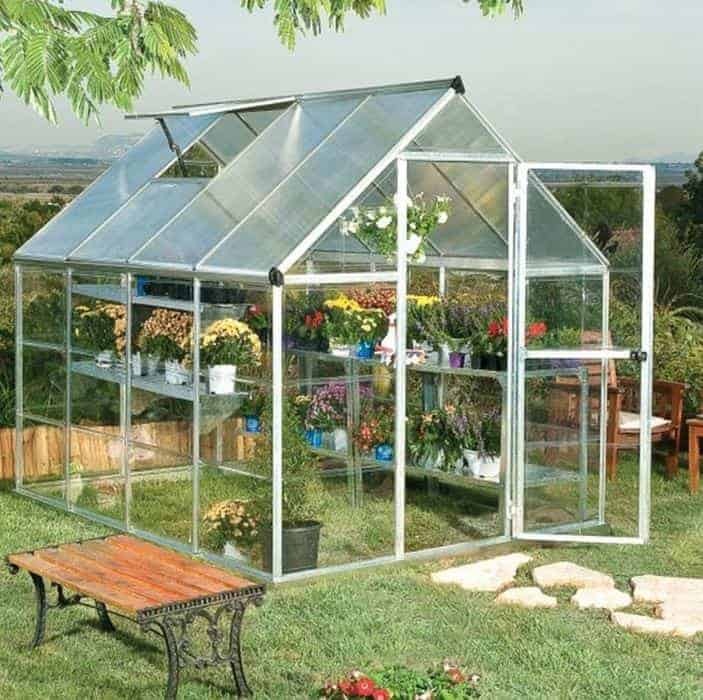 This plastic greenhouse is even more accommodating than the one preceding it, but it also comes with a significantly more expensive price tag which is why it has been given the lower position. If this falls within your budget for a large greenhouse, however, then it could prove to be just what you’re looking for, especially if the look of a greenhouse is almost as important to you as its performance. This has a unique look for a large plastic greenhouse, and it’s one that we found very striking. The racing green colour scheme is itself often a signifier of a high end greenhouse, but what makes this one stand out is the geometric shaping of the apex roof. It has a double sloping style that mimics the look of a Dutch barn, a look that we always like when applied to garden buildings. While carrying rain water away also makes the most of any sunlight that falls upon it, and that can bring real benefits to plants growing inside. We would have liked to see a slightly longer warranty period at this price than the 5 years provided by the manufacturer, but in reality we wouldn’t be surprised to see it far exceed that period without any problems becoming evident. Eight foot by eight foot are in many ways the classic dimensions for a plastic greenhouse, as they mean that it can hold a good selection of plants and seedlings whilst still not taking up too much precious space from the garden itself. 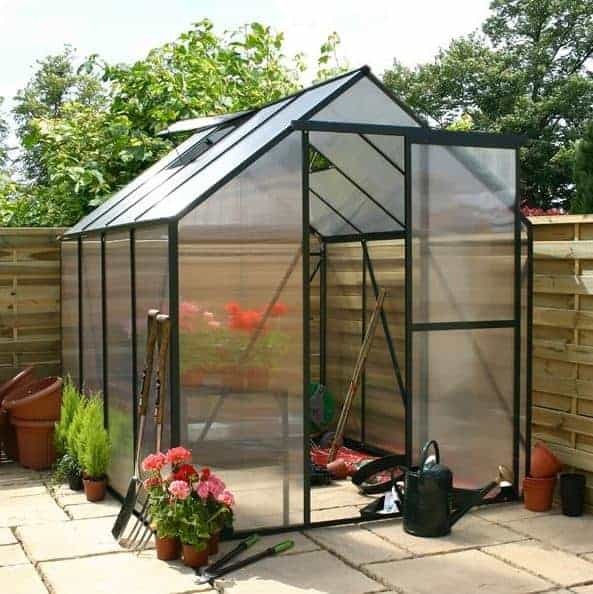 They are also typically available at an affordable price, and although there are cheaper greenhouses than this boasting similar dimensions, we still feel that this represents reasonable value for money when its longevity and design quality are taken into consideration. As always, this value becomes even more magnified when compared to glass greenhouses, which is why polycarbonate is becoming an increasingly popular glazing choice. The green aluminium frame is covered by a 10 year guarantee, which is something that we’re always glad to see in a mid sized plastic greenhouse, but what impressed us most about this model is that it feels very secure and stable once it has been assembled.That’s because corner plates have been fitted along with roof and side braces, giving it extra strength and rigidity where it needs it most. For that reason, this is a greenhouse that we feel would be especially suitable for use in open and exposed areas, giving plants much needed protection from wind, rain and snow. Some traditionalists may think that a plastic greenhouse can never have the elegance and aesthetic appeal of a glass glazed greenhouse, but the victory orangery and sun lounge from Palram proves them wrong. 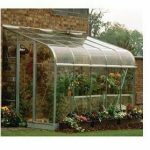 This is an eye catching garden building that’s sure to have people talking about if for all the right reasons, and is the most attractive polycarbonate greenhouse that we’ve seen. What makes it stand out from the crowd appearance wise is the t-shaped design, emulating a small glass cathedral. It’s not only very beautiful, it’s very practical too as the dimensions of 3.61 x 3.06m means that there’s lots of room to grow plants in, especially when the very generous 2.70m ridge height is also taken into consideration. The aluminium frame which supports the polycarbonate panels is also covered by a 5 year guarantee, although a longer guarantee at its asking price of over a thousand pounds would have seen it gain the higher position that it otherwise deserves. We can easily imagine this being used as a garden office by people who work from home, or as a summer dining room or a place to entertain visiting guests, but whatever you intend to use it for it’s unlikely to disappoint. 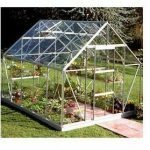 For a plastic greenhouse with such generous dimensions, this represents very good value for money which makes it ideal for those looking for a large second greenhouse, or an inexpensive upgrade when they need extra space for their plants. It has a base width of 2.50m and a base depth of 4.25m, as well as an apex roof which reaches up to 2.16m or over seven feet tall. If you have plants that need a lot of room to thrive, then this could be just what they’re in need of. We were pleased to see that there are four opening roof vents, as we often see large greenhouses that only have two. In this way, it’s easy to create a steady circulation of fresh air which will greatly reduce the risk of the environment becoming too hot for your plants on a summer day. One other feature that we especially liked was the inclusion of an anchor kit as standard, with free ground pegs that can be used to secure the plastic greenhouse to a pre-existing area of level concrete, or alternatively a flat area of paving or patio. 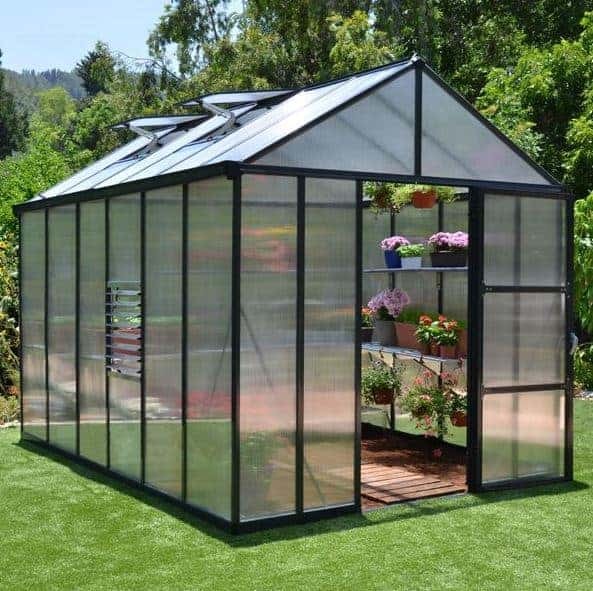 With so much to recommend this large greenhouse at what is a surprisingly low price, it’s only the lack of an extended warranty period that prevents this one from being placed much higher up our list of the very best plastic greenhouses. We’ve reviewed all kinds of garden buildings made by BillyOh, and we’re glad to say that their greenhouses are just as well designed and fabricated as we’ve come to expect from their garden sheds and log cabins. The base dimensions of 1.85 x 2.48m make it perfect for a small garden, and yet the generous ridge height of 2.09m mean that you can fit more plants in than you might initially expect with the addition of shelving or staging. One thing that we especially liked about this plastic greenhouse was its clever hybrid design. This means that whilst the walls are made of single polycarbonate glazing, as we’ve come to expect in the less expensive plastic greenhouses we review, the apex roof is constructed of twin walled polycarbonate. This gives it extra strength and protection against the elements, and it also helps to reduce the amount of heat which is typically lost through the roof. This means the interior stays warmer for longer, although there’s also an opening vent that can be called into action if it gets a little too hot inside. This is a well built plastic greenhouse that could have been placed much higher up our league table if it had been given the protection of an extended warranty period. 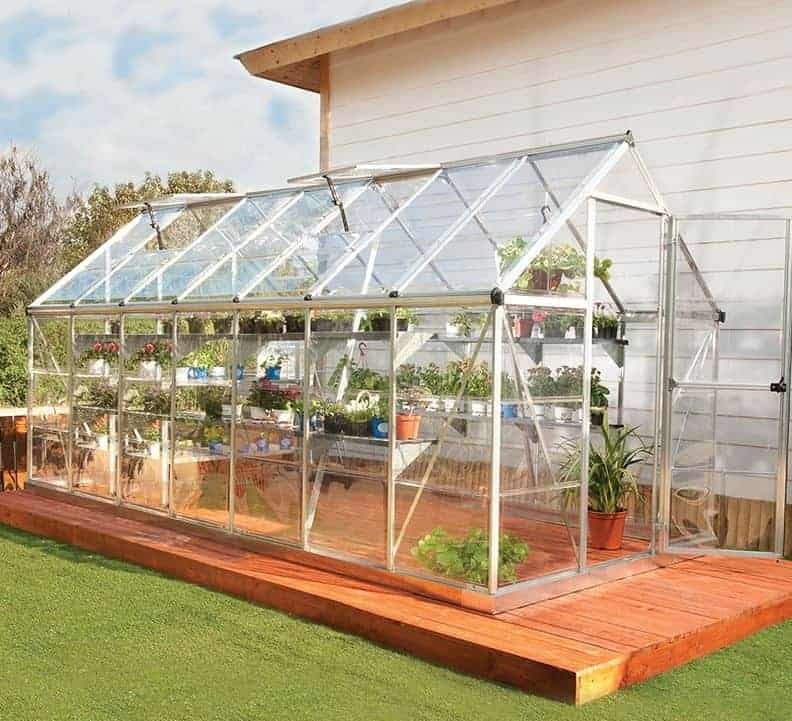 This plastic greenhouse is unlike any other that features in this league table of the 20 best that can be bought online in the UK today, and it’s its versatility that helps it claim a place. In contrast to the traditionally styled greenhouses we’ve reviewed, this takes the form of a sun room. That means that its attached to the house itself, so that as well as being a great place to grow plants it can also act like a conservatory or even as an extra living space for your home. Despite this dual nature, it has everything needed to succeed as a plastic greenhouse. By that we mean that it has a strong white resin frame, which we were pleased to see comes with a 7 year warranty from the manufacturer, and 4mm thick polycarbonate sheets that are UV stable and so won’t yellow or become murky over the years. There’s also a vent in the roof which will be welcomed by both plants and people on a hot day. 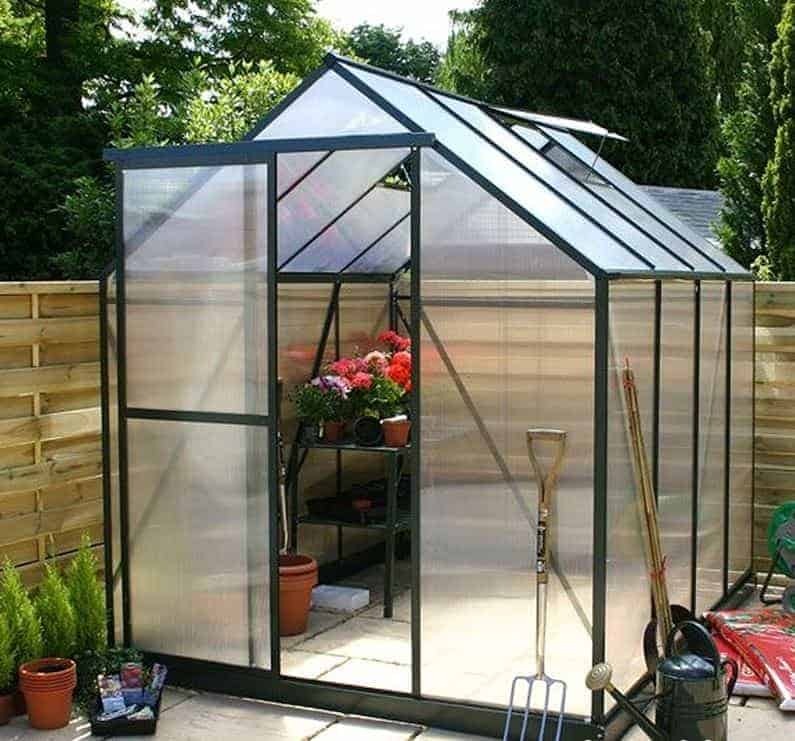 This certainly isn’t the cheapest six foot by six foot greenhouse that we’ve reviewed, which is why it finds itself in the final quarter of our list, and yet it has a lot to offer that many greenhouses don’t and it will make an attractive addition to any property. This dark green painted plastic greenhouse will add a touch of class to any garden, and yet the shatter resistant polycarbonate panels used for the glazing are not only much more affordable than glass, they’re much more practical as well. Having to spend time and money replacing panes is a thing of the past, as the thick polycarbonate we found on this model is virtually unbreakable under normal circumstances. Indeed so tough are the substrates used, with powder coated aluminium supplying the frame, that we are a little disappointed that it doesn’t come with an extended warranty on top of the one year statutory period. This has, of course, been considered when determining the final position of this greenhouse in our league table. 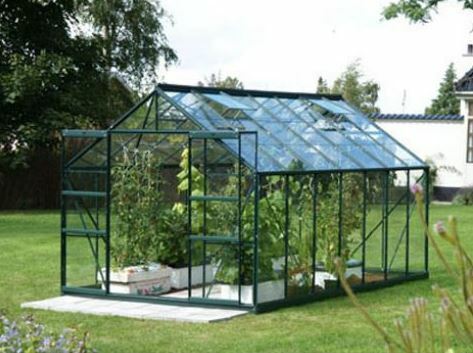 Nevertheless, this comes at a very affordable price for a six foot by eight foot plastic greenhouse, and with the components used likely to prove very durable we don’t feel that the lack of a long warranty period should be taken as too much of a negative. On a positive note, we were pleased to see ground stakes included for the corners as this gives it a very good stability in windy conditions, and we are always pleased to see guttering included as standard as it was on this occasion. This is the only timber framed plastic greenhouse to enter our top 20 league table, and yet it deserves its place as the predominant feature of the building as a whole is the tough styrene plastic cladding. 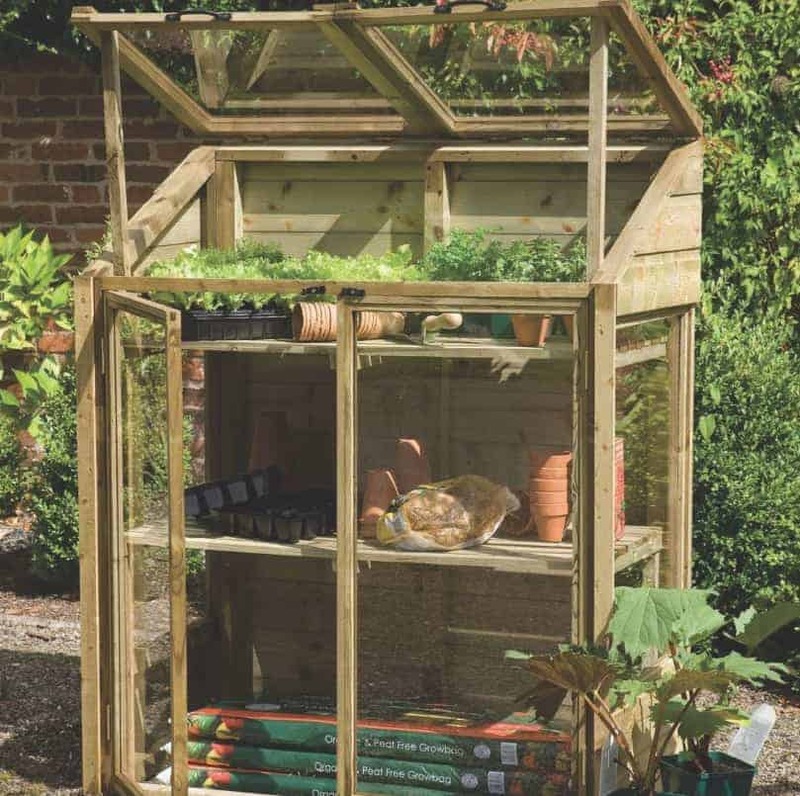 This is also the smallest greenhouse in our list, and its mini greenhouse styling makes this a unique proposition and one that we feel could come in very useful for a lot of people. Because its base size is so compact, measuring approximately four feet by two feet, it can be used by people who have no free garden space at all; its lean-to design means that it could easily be positioned next to a house or even on a balcony. Despite its tiny size, we found this a suprisingly practical plastic greenhouse. The double doors at the front make it easy to bring plants in and out, as does the double hinged roof which can also be lifted up to allow ventilation in as well as to provide easy access. We were also pleased to see that the timber had been given an initial pressure treatment as well, which makes it very resistant to rot, and this is reflected in a 15 year anti-rot guarantee. If you want a small structure to grow plants in all year round, this is definitely worthy of your consideration.